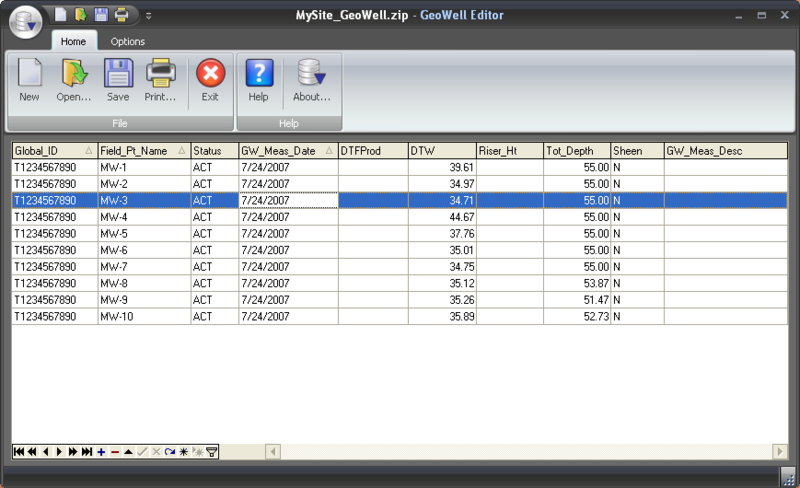 The GeoWell Editor™ is a stand-alone editor that simplifies the production of GEO_WELL data files for submission to California’s GeoTracker system. 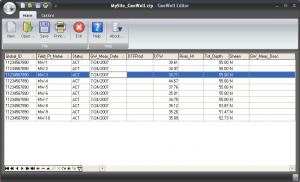 GeoWell Editor™ handles the tedious aspects of formatting data files and of providing data entry validation. It does this by providing data entry validation and eliminating the need for you to manually export data to the specific format required by the GeoTracker system. The GeoWell Editor™ is free. You can download GeoWell Editor™ by visiting our download page. 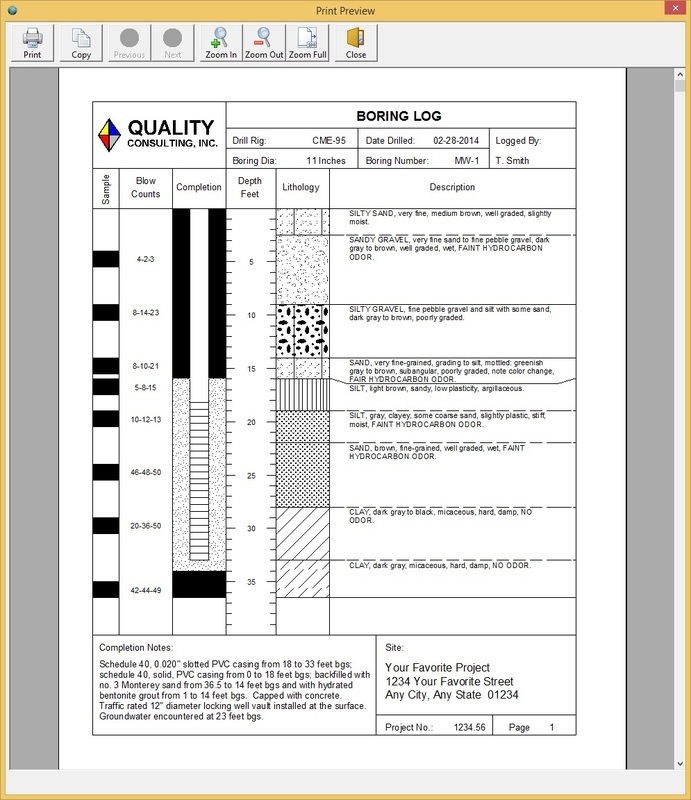 Well Logger™ enables you to easily create soil boring logs and well construction diagrams. It boasts a simple, yet robust, user interface that features customizable layouts, user-definable fill patterns, adjustable scaling, and print preview. 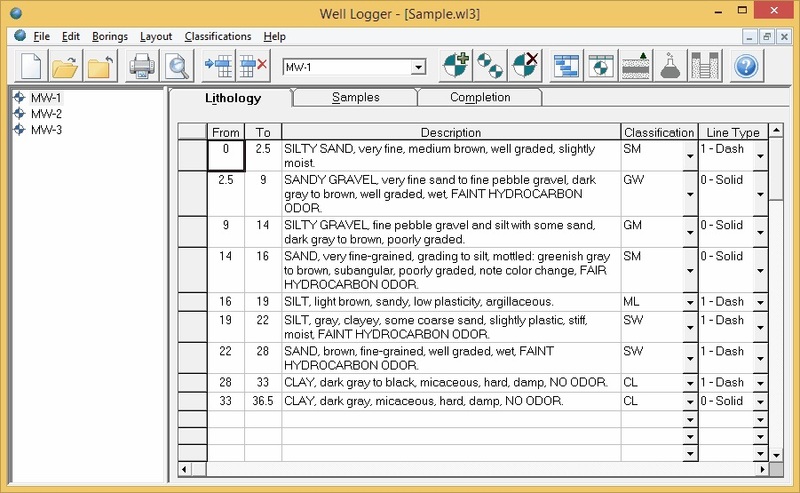 One of Well Logger’s™ strongest selling points is its simplicity … it was designed from the ground up to be an easy way for environmental and geotechnical consultants to create report-quality drafted soil boring logs. Because of its designed simplicity, Well Logger™ can produce your boring and well logs in half the time of traditional CAD style programs (this can save you money in the long run). 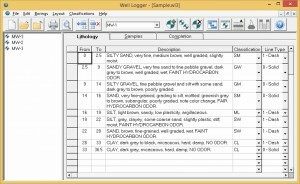 Project geologists and engineers can use Well Logger™ on a laptop at the work site to quickly complete necessary documentation — usually during available drilling downtime. Well Logger™ was designed to be easy-to-use. The software interface is designed to be simple, yet very functional, which means it takes you less time to create a drafted boring log. Well Logger™ features an easy-to-use spreadsheet interface with drop-down boxes for simplifying data entry of each borehole. Entry information includes borehole lithology, samples collected, well construction or borehole backfilling details, and general information about the project and boring. Well Logger™ features the ability for the user to create customized layouts for use with virtually any printer. Several pre-defined layouts are also included to get you started quickly. Well Logger™ allows the user to create or modify fill patterns for lithology, sample type, and well construction graphics. Unified Soil Classification System (USCS) and other geological and industrial fill patterns are included. Over 70 variables (e.g., Page Number, Total Depth, Project Supervisor, etc.) can be included in the page layouts that you create. Ten user-definable columns are available for including geotechnical properties, chemical concentrations, or other characteristics of soil samples. Congratulations on developing the real McCoy. Others claim simplicity and ease-of-use. Well Logger delivers! Hands down, Well Logger is clearly the easiest and most straight forward to generate borehole and well logs. 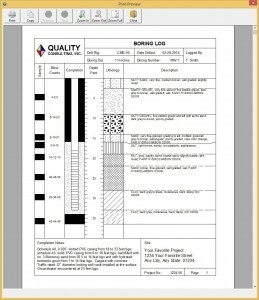 Using Well Logger, I was able to create and print a borehole log in 10 minutes, the very first try! It worked! That is what I call support!! !